Just an update on things I've been working on. I've been busy sewing and living. You know. I made these potholders for my sister Teri. 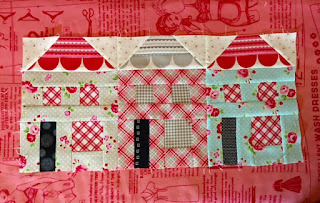 I used the barn block from Lori Holt's book Farm Girl Vintage. The last thing I need is another valentine quilt but I can't resist. I used the scallops for the edge from Sunrise Studio. I can't get enough of them. I have them in all sizes now. I snapped this pic from my ironing board. You can see my cute ironing board cover using Lori Holt fabric. I used the medium sized scallops for these houses. And Pam Kitty Morning fabric from my stash, among other fabrics. More houses. I have more hearts I'm making, too. Can't stop I guess. 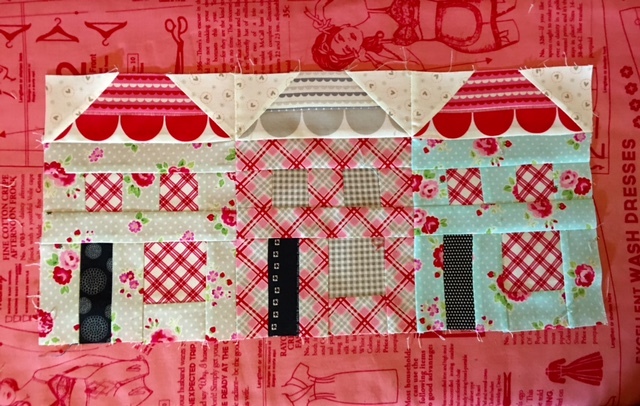 So I'm now making a Home is Where the Heart Is quilt. Just mashing hearts and houses together. I'm sewing an hour or so each day. It is easier on me to not marathon sew anymore. But sewing is so good for my head. It clears out the cobwebs. I love making house blocks and mixing them with hearts makes for a wonderful quilt. Hi, Nanette! 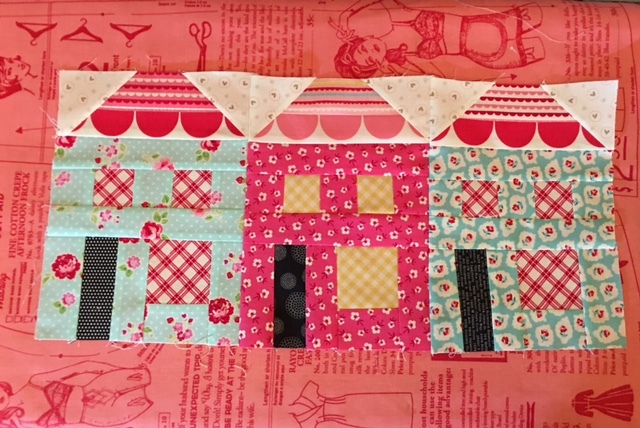 Glad sewing is still floating your boat (and scalloping your roofline!) Enjoy, enjoy. 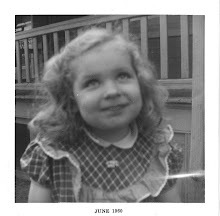 It is so good to see you sewing and in blog land. Your pot holder and houses are so cute. اذا كانت تبحث عن [url=https://www.nileriyadh.com/%d8%b4%d8%b1%d9%83%d8%a9-%d8%aa%d9%86%d8%b8%d9%8a%d9%81-%d8%a8%d8%a7%d9%84%d8%b1%d9%8a%d8%a7%d8%b6/]شركة تنظيف بالرياض مجربه[/url] له اسما عريق ولديها الخبره فى التنظيف عليك الاتصال على شركة ركن كلين لخدمات التنظيف بالرياض اذا كانت تبحث عن المعدات والاجهزه والاسعار المناسبه لك على التوصل مع شركتنا لان لديها عروض خاصه واسعار مناسبه لكل عملاء. It is very glad to here that you are more creative in your life.Sewing is an art.Alzheimers Care Tampa wishes you the best.Keep going . Wonderful Post. Thank you so much for sharing this!!. If you are looking for any professional essay writing service you can choose us to get best custom essay paper at affordable price. This is a great article, that I really enjoyed reading. Thanks for sharing. our essay writing services experts could address students' academic topics quite well. Thus, they can opt for our service if they have difficulty in writing the academic task. I am so glad to read this post. I want to thank you for this good share. I have bookmarked it and I am looking forward to reading new articles Visit application essay writing service to know more about us.